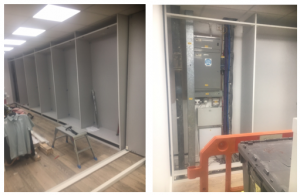 Storage and Interior Concepts are just installing some cupboard walling in an office in Leicester. We have built new cupboards around the existing wall mounted electrical boxes. The flush fitting doors will soon be installed. We have a very large showroom in Melton Mowbray, where you can see the cupboard walling, partitioning, mezzanine floors, office furniture, seating, floor coverings etc.